Pick a test material from the available collection of sample squares (different materials and different thickness). Equal quantities of hot water are put in equal foam cups and the class will discuss how to organise the experimental analysis. Students will choice, in groups, 2 sample squares and will discuss with the teacher their choice by making predictions about the thermal insulation of the chosen squares. • To be able to classify materials according to their capacity to conduct heat. • Couples of squares of the same material and surface and different thickness. • Temperature sensors to be put on the inner and outer surfaces (see Fig 2.2a) . Students place in the cup, along with a thermometer, a given quantity of hot water. They can register temperature at fixed time instant. 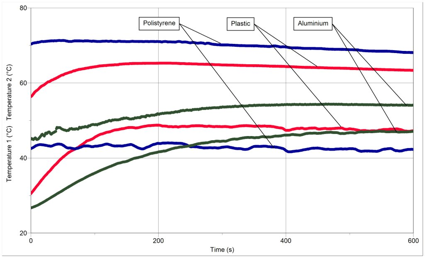 To use temperature sensors can speed up the procedures and it results more effective in the visualization of temperature data.Students can analyse:The difference between the inside and outside temperatures of all the materials (see fig. 2_2a) and verify that their temperature are almost constant (for a time of the order of some minutes). (See figure 2.2b). 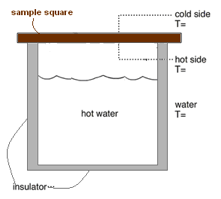 The whole class can analyse the data of groups that used squares of the same thickness and order the materials from the greatest to the lowest temperature difference (see fig. 2_2_c) and define (on the basis of measurements) which material they think is the best conductor and the best insulator. Students compare the results of their experiments to their predictions and proceed in identifying and justifying any differences. Outline differences of materials used in the construction of different kinds of buildings with respect to thermal insulation.